Here, we present a guide on how some wise tax-saving investments that can help reduce your outgo and thus, give you greater income in hand. It is that time of the year when we need to begin planning our taxes and declare to our employers as to how we will go about the plan. Here, we present a guide on how some wise tax-saving investments that can help reduce your outgo and thus, give you greater income in hand. The first thing an Indian taxpayer must know about is Section 80C. Among the various exemptions that the Income Tax Act offers to Indian taxpayers, Section 80C is one of the most popularly known exemption. This particular section alone exempts tax up to an outer limit of Rs1.50 lakh per financial year on a series of contributions. Broadly, there are two types of contributions that are eligible for exemption under Section 80C. First, there are specific investments such as Public Provident Fund (PPF), long-term deposits, National Savings Certificate (NSC), and equity-linked savings scheme (ELSS), where you can invest for long-term growth and get tax benefits. Second, there are also select payments such as premium on life insurance, tuition fees for your children, and principal repayment of home loan that are eligible for exemption under Section 80C. This exemption is applicable to each financial year and the total eligible contribution is directly deducted from the taxable income. 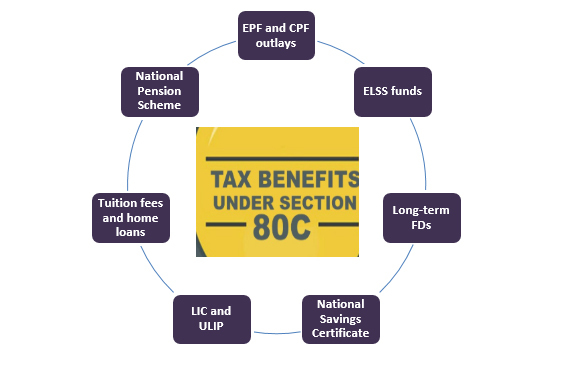 Let us look at some key investments and payments that are eligible for Section 80C exemption and some of their unique features. Employee contributions to the Employee Provident Fund (EPF) are mandated to be at 12% of the basic salary plus dearness allowance (DA) and the employer matches this contribution. However, only the employee’s contribution is eligible for Section 80C benefits. On the other hand, Public Provident Fund (PPF) rates are fixed by the Finance Ministry and they are instruments of high safety. PPF has a minimum lock-in period of 5 years and loans can be taken against PPF after this lock-in period is completed. Withdrawals are permitted from the seventh year onwards and the interest on PPF and the final redemption is entirely exempt from tax. These specific tax-saving equity funds (with a 3-year lock-in period) have become quite popular over the last few years. Unlike PPF and bank FDs, where the returns are regulated, ELSS funds are a market-linked product. Dividends on ELSS are tax-free in the hands of the investor but are subject to Dividend Distribution Tax (DDT) at 10%. Effective April 2018, any LTCG earned on ELSS funds above Rs1 lakh is subject to tax at 10% without the benefit of indexation. ELSS remains a good instrument for combining tax-saving and wealth creation. These are like normal bank FDs but are subject to a mandatory lock-in of 5 years. The rates of interest are also at par with the bank FD rates. Only the contribution to these long-term FDs qualify for exemption under Section 80C. It needs to be noted that any interest that is received on such FDs will be treated as taxable income and taxed at your peak rate. The NSC requires very minimal documentation and can be purchased at your neighbourhood post office. The interest rates on NSC are also announced by the government from time to time. NSC contributions are subject to a minimum lock-in period of 5 years. The interest is not paid out each year but is accrued and paid out on redemption. However, even though you do not receive the interest, you need to show the accrued interest each year in your tax returns and pay tax on the same. Life insurance contributions are eligible irrespective of whether it is a term policy, an endowment policy, a money-back policy, or a ULIP. Any death benefit received or proceeds received on maturity, including bonuses, are fully exempt from tax in the hands of the recipient. 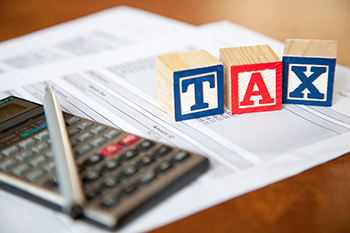 In the case of ULIPs, the tax exemption is calculated differently. Section 80C exemption on ULIPs is available on the lower of the two (10% of the sum assured or actual premium paid). Even if ULIP has an equity component, there is no LTCG tax on redemption. With the rising costs of education, the Income Tax Act has extended the benefits of Section 80C to tuition fees paid for two children. This exemption is only available to annual tuition fees and not to any donation, capitation fees, or building fund. On the other hand, while home loan interest is exempt under Section 24 of the Income Tax Act, the principal component is exempt under Section 80C. Interestingly, in the year of completion of your property, the stamp duty and registration charges can also be claimed as part of home loan principal under Section 80C. Contributions made by an employee towards the National Pension Scheme (NPS) is allowed as a deduction under Section 80CCD, an adjunct of Section 80C. The advantage of the NPS contribution is that even if you have exhausted your limit of Rs1.50 lakh under Section 80C, the NPS contribution entitles you to an additional exemption of Rs50,000, thus taking your total exemption limit to Rs2 lakh. This extra benefit is not only for NPS but also for contributions made to APY schemes. When selecting your Section 80C investments and contributions, you need to focus on the returns, risk, wealth creation potential, levels of tax benefits, and liquidity so that you make the best of both tax-saving and wealth creation.